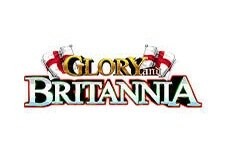 "A high quality video slot from NetEnt with excellent graphics and animations, and many exciting features with a potential to deliver bumper payouts." 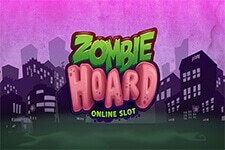 NetEnt brings the newest addition to its portfolio, a five-reel video slot with 20 fixed paylines. 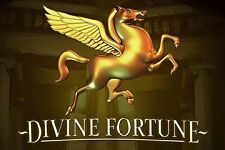 Released in January 2017, Divine Fortune is inspired by Greek mythology and this theme dominates the entire game from the main screen scenery to the symbol design, with high quality graphics, beautiful animations and a matching soundtrack to go with it. On your epic quest to land the game’s progressive jackpot, you will encounter numerous mythical creatures such as Minotaur, Phoenix, Medusa, and the Nemean Lion, constituting the high paying symbols, or see the elusive Pegasus and admire the might of Zeus’s lightning. 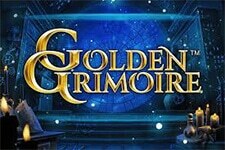 But what will surely delight the players is the variety of interesting and lucrative features. Get the most out of them and you can definitely expect big payouts. Before you hit Spin button, make sure to choose your preferred coin denomination, ranging from $0.01 to $0.50, while the wager can go anywhere between $0.20 to $100 per spin. Spin button in the middle of the bottom part of the screen features a laurel wreath, while right next to it are Autoplay and Bet Max buttons, whose function is pretty much self-explanatory. 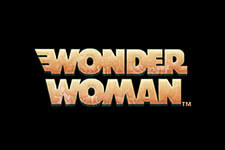 As mentioned earlier, the slot’s special features are an opportunity to win big time. The slot really went wild (pun intended) with the Falling Wilds Re-spins, which will give a free re-spin as long as there is at least one Wild on the reels, whereas the Wild on Wild will set Pegasus free. 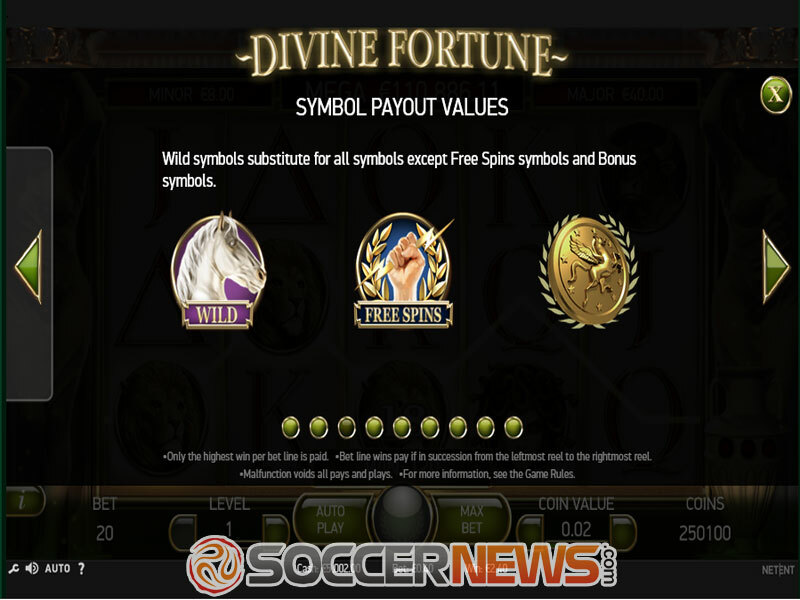 Land three or more Free Spins symbols to trigger 5, 8 or 12 Free Spins, depending on the number of icons that triggered the feature. 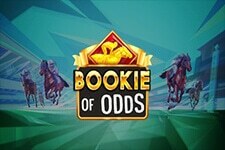 Three Bonus symbols in the pot activate Jackpot Bonus game, giving you the chance to win three different jackpots – Mini, Major and the progressive one called Mega Jackpot. 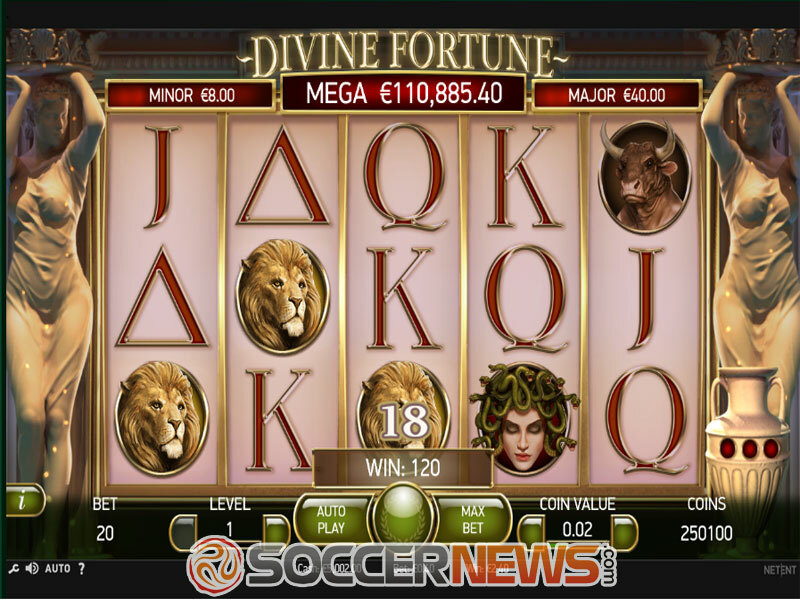 Visit one of NetEnt casinos and choose Divine Fortune from the lobby. Select coin value and place your bet. Start landing those winning combinations. 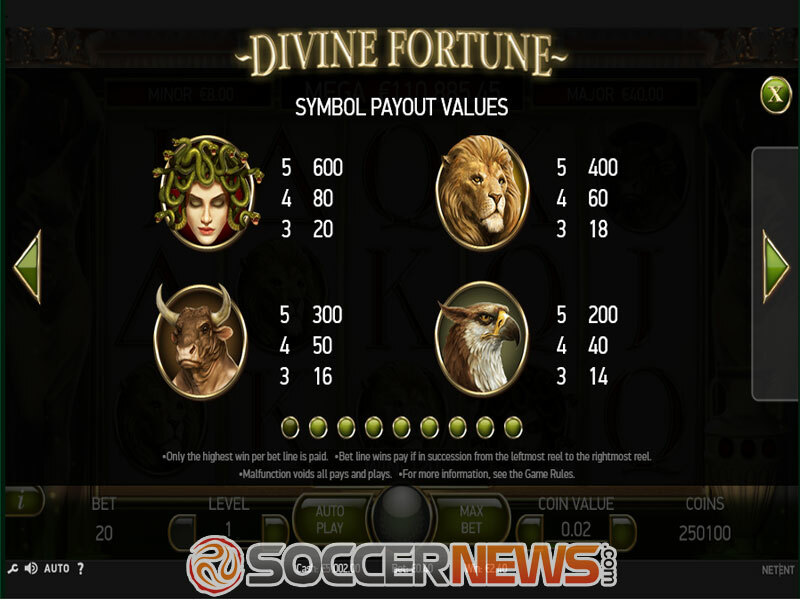 "Divine Fortune brings ancient Greece to your desktop and mobile devices. 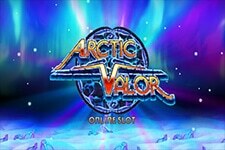 Embark on a mythical journey, activate the slot’s numerous bonus rounds and land rewarding payouts in the 2017 release."